Tifinagh Font is of Professional-quality, scalable TrueType and Type 1.Tifinagh font is for typing the Tamazight, Rif Tamazight and Tamashek languages of North Africa. The product includes a User's Manual, keyboard layout chart(s), and Character Code Tables showing every character in the font(s). The included Keyboard Switcher (keyboard driver) allows access to four characters per key (instead of the normal two) and alternate keyboard layouts. These fonts will print to any printer at the highest quality allowed by your printer. The TrueType® fonts install into Microsoft® Windows XP, 2000, NT, Me, 98, or 95 and work with all Windows XP-, 2000-, NT-, Me-, 98-, and 95-compatible applications that allow the user to select fonts from a font menu. (A custom version for Windows 3.1 is available by request.). Mac SE-30 or newer. The font may be typed in OS 7.1-9.x and OS X using the US keyboard. 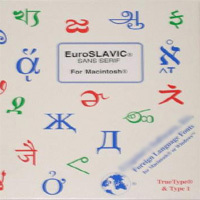 The optional EuroScript® scripting system installs into System 7.1-9.x or OS X in Classic Mode (and has been tested in OS X 10.3 Classic Mode).